Fuji Stars: Lap. queen, king size quilt features Yuki panel for stars. 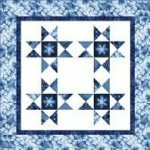 Kit is for lap quilt 66"X66" featuring a fussy cut snowflake center of each star. Beautiful blue fabrics from the Yuko collection by Moda and Moda Bella are included for the top and binding.